Good building and delicious food go hand-in-hand. Having a nice atmosphere in which to prepare and eat our meals is important to our school. Our spring workshops are geared towards creating this shared space. Over the course of two week-long workshops, we will construct a community kitchen and dining house beside our pond. The building process will include a variety of techniques: cob, strawbale, dry-laid stone, roundwood framing, wattle-and-daub, living roof installation, slip-straw, and natural plasters. The focus of one workshop will be cob. The other will emphasize strawbale. In our strawbale immersion, we will be stacking bales in a variety of ways: in a stud wall, in a post-and-beam-style wall, and in a “balecob” hybrid wall system. We will also use straw in its loose form to make some slip-straw walls. The foundation and some framing will be in place; we will complete the framing, install a metal roof, and then build our natural walls. You will learn how to design around bales, shape them, connect them together, protect them from water, and finish them with plaster. We will integrate doors and windows, as well as sculptural details. 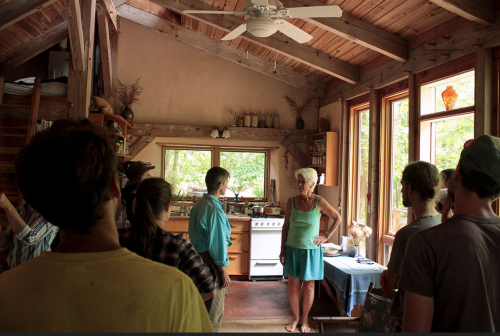 We will tour local, permitted strawbale homes, and will have discussion surrounding the permitting process. We will additionally be building with cob and wattle-and-daub. There will be a good amount of time to get comfortable with mixing and applying natural plasters, too!